Now that the AMD Radeon RX 480 video card has been successfully rolled out for $199 for the 4GB model and $249 for the 8GB model, AMD’s able to shift focus on bringing their 14nm FinFET GPU technology down to lower price points. The next card AMD will be releasing launched earlier today and that would be the Radeon RX 470 4GB graphics card at $179. This card is aimed at 1080P gamers that are looking for 60+ FPS performance on AAA game titles with Anti-Aliasing enabled. To bring this card to market the engineers over at AMD took the Polaris 10 GPU used on the Radeon RX 480 and internally disabled a few things. Compared to the AMD Radeon RX 480 the Radeon RX 470 has 256 fewer stream processors and 16 fewer texture units. The 2048 stream processors that the RX 470 does have have a boost clock minimum speed 1,206 MHz (926MHz base) and the 4GB GDDR5 memory runs on a 256-bit bus at speeds of at least 6.6Gbps (6,600MHz). The AMD Radeon RX 470 has a 120W TDP, which is 30W lower than that of the RX 480, so we shouldn’t have to be worried about too much power draw from the PCIe slot or the 6-pin PCIe power connector. Notice that these are minimums and that is because there is no actual reference design. AMD is letting all their board partners release custom boards for the RX 470 launch and is just giving guidance on minimum clock speeds and suggested retail pricing. Most all of the AMD Radeon RX 470 cards will be of the 4GB variety although we have been told that some board partners may release 8GB versions to help differentiate themselves from others. We did 4GB versus 8GB benchmarking on the AMD Radeon RX 480 and saw basically no performance gains at 1080P and 1440P gaming resolutions, so a RX 470 8GB card for 1080P gaming seems like a bit of a waste. Today we’ll be looking at an XFX Radeon RX 470 4GB graphics card, but we should tell you that there are seven different RX 470 models available from XFX. The good news is that some of the models are region specific and when you boil it all down there are three main models offered and they are all factory overclocked. 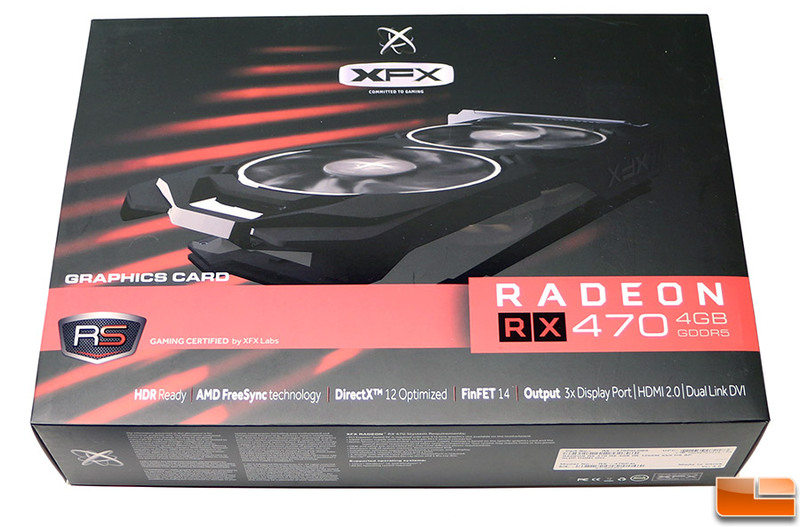 You have the XFX Radeon RX 470 Triple X Edition (1226MHz boost) that is available in single and dual fan configurations, a Black Edition (1256MHz) and the Black Limited Edition (1280MHz) that have dual fan cooling solutions. All of the cards are equipped with XFX Ghost 4.0 Thermal Technology with 3 direct touch copper heatpipes to help keep the Polaris GPU as cool as possible. 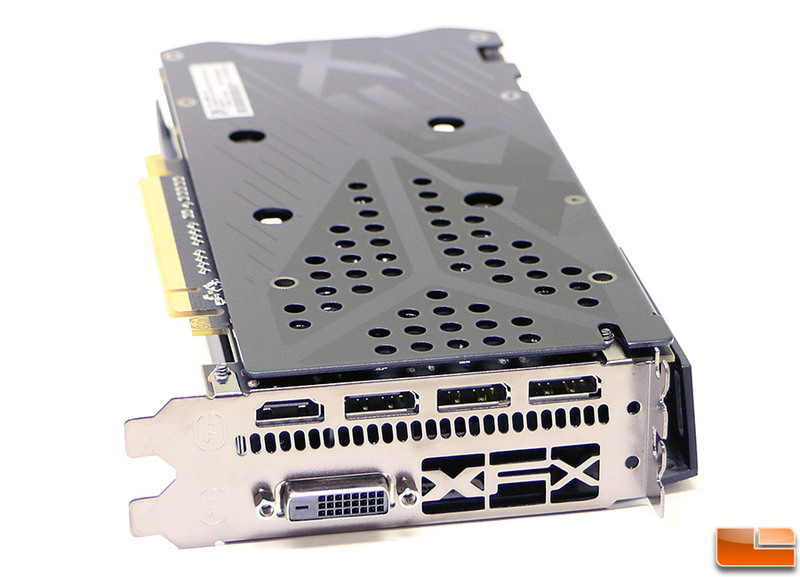 The bad news is that all of the XFX branded cards are priced well above the AMD Radeon RX 470 SRP of $179. We found the lowest priced XFX Radeon RX 470 4GB card is priced at $199.99 and then it goes up to $219.99 and then to $229.99. The AMD Radeon RX 480 4GB starts at $199 and has more stream processors and texture units, so AMD has a pricing mess here. Multiple sources inside the graphics card industry have told us that the AMD Radeon RX 480 4GB availability is going to be really tight and that AMD priced the card too low to begin with. It also appears that the AMD Radeon RX 470 is priced too low as we’ve only seen one priced at $179.99 plus $4.99 shipping. The model that we’ll be looking at today is the XFX Radeon RX 470 Black Edition that is priced at $219.99. The card comes in a nice looking retail box, but we have been told that the packaging we got might not be the final packaging as we got the card ahead of the retail launch by a handful of days. 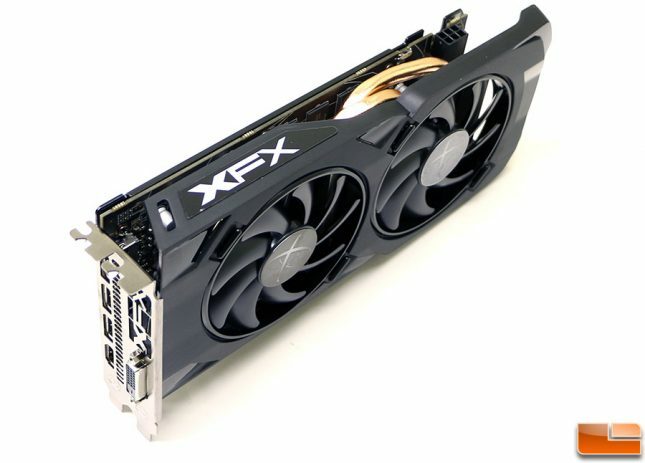 Th XFX Radeon RX 470 4GB Black Edition graphics card measures in at 9.45″ x 4.76″ x 1.57″ (L x W x H), so at just under 9.5-inches in length it should fit in the majority of desktop PCs. It features XFX’s Ghost 4.0 Thermal Technology and that means it has three direct touch composite heat pipes for improved heat dissipation and new UniBody VRM construction for direct heat transfer of the power components straight to the primary heatsink for better cooling. XFX recommends a 500W or greater power supply with a 6-pin PCIe power connector for your gaming system with this 120W TDP video card model. Note that the 6-pin PCIe power connector on this board is rear facing. To the left of the power connector is a BIOS selector switch that can be used if one BIOS ever should fail. Both BIOS versions are the same, so it’s just there for redundancy. 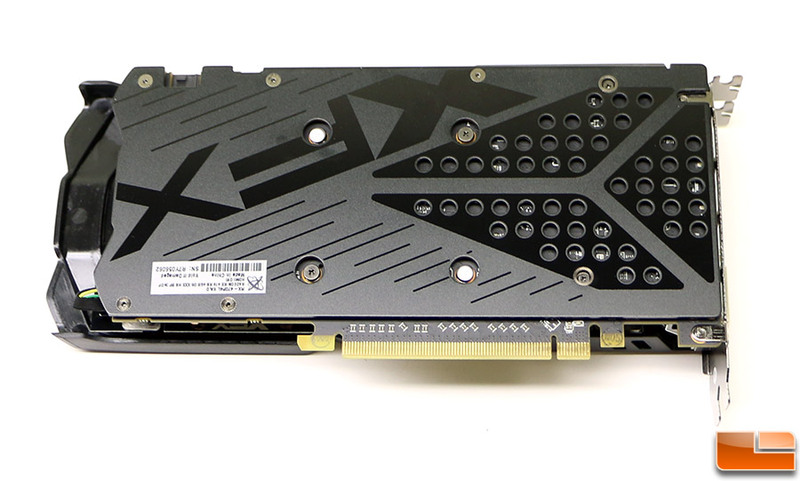 The XFX Radeon RX 470 comes with a full coverage black metal back plate to help protect the components on the back of the card and to add rigidity to the card to keep it from looking saggy on the far side of the PCIe x16 slot interface. There is no thermal pad behind the VRM components, but there are a number of holes in the backplate that should allow for some hot air to escape for improved ventilation. Notice that the cards main PCB is only 8.25″, but the fan shroud extends past the board and it has a daughter PCB for the fan headers. XFX went with three DisplayPort 1.4 outputs, one HDMI 2.0b and a Dual-Link DVI-D connector when it comes to video outputs. The HDMI 2.0 port does support 4K (up to 4096×2160) @ 60Hz! Sapphire does not include any DVI to VGA adapters or SLI bridges in the accessory bundle with this card, so just a friendly heads up there. We aren’t going to bother showing you the box or retail bundle as you just get a quick start guide and a driver disc (who really loads drivers from a CD-ROM these days anyway?). Notice that the card is higher than most as the fan shroud extends above the bracket on this dual-slot card. Here is a closer look at the heatsink Sapphire is using on the RX 470 and just a better look at the top of the card that you’ll see from your case window. The XFX is not LED backlit, so if you want LED lighting or full RGB lighting this is not the card for you. 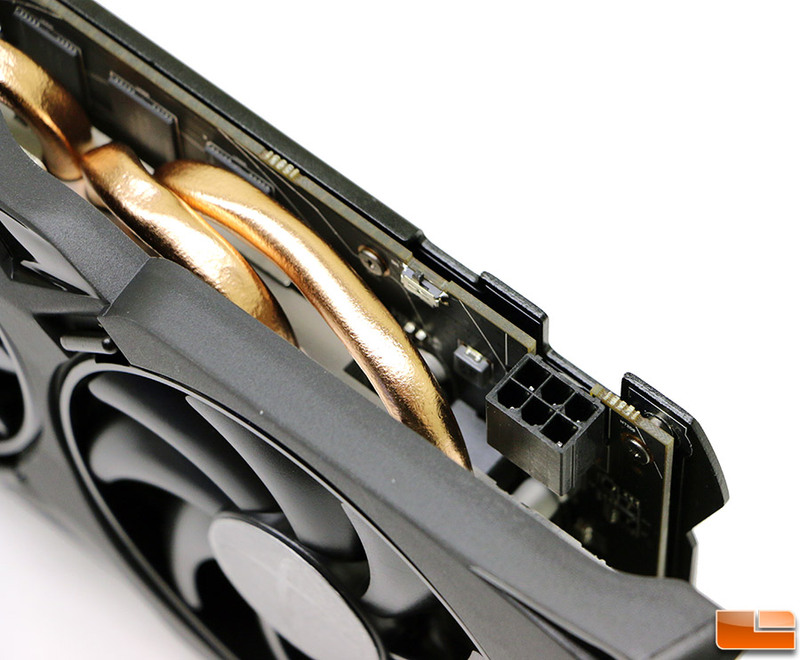 One of the nice new features on this video card is that XFX is now using a hard swap interchangeable fan system. The XFX Radeon RX 470 4GB comes with solid black fans, but you can purchase optional fans that have different color fans or some that have LEG lighting. This will allow you to customize your system and also quickly buy new fans if one should fail when the card is out of warranty. We removed the fans and found that XFX is using FirstD Brushless FDC10H12S9-C model fans that are made in China are the factory fans. 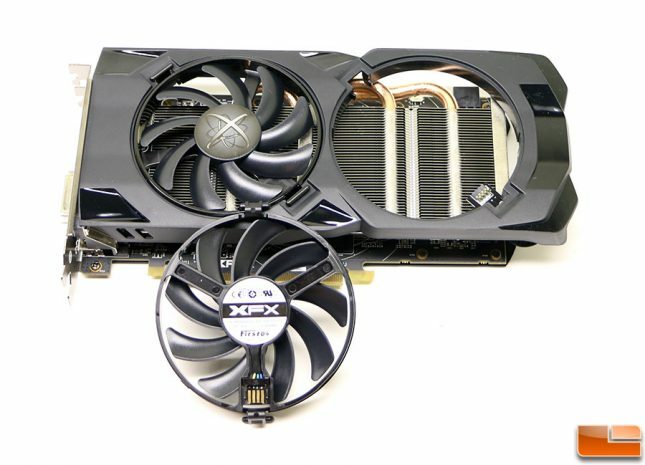 XFX hopes to have the fans out in early September and is working on product packaging for the fans now. We are hopeful that they will be $20 or less as that is a price point we see people happy with for some nice LED fans. Now that we have the basics out of the way we can take a look at the test system and get to the benchmarks!